Special treat to start off your week, a guest post from the Hubby!! At least one thing will cheer you up on a Monday...Fall beers! Hey there Kettler Cuisine readers! Ryan aka “The Hubby” here. Hope you’re enjoying everything that comes along with the Kettler household’s favorite season, FALL!! Color-changing leaves, football, bonfires, Halloween, and hoodies aren’t the only things that I look forward to. I also anxiously await the release of the many glorious Fall seasonal beers that some of my favorite breweries put out! These beers span the autumn flavor spectrum. Typically you’ll see A LOT of pumpkin and marzen (the traditional oktoberfest beer) along with some lesser known flavors like maple. More darker beers such as stouts, porters, and browns come into the equation. These Fall beers are usually higher in alcohol content so they have a nice warming effect on cooler evenings. Dark beers tend to be smoother because of their dark malt characteristics (think of the velvety consistency of a Guinness as opposed to the crispness of a pilsner for example). One thing’s for sure: there’s something suitable for even the most fickle palette. Today I would like to share with you 5 of my favorite fall seasonal beers, so sit back, pour a cold one (or a hot toddy), and enjoy! Warlock - Southern Tier Brewing Co. This imperial pumpkin stout gets us started with a bang. At 8.6% abv, it’s not messing around. I was able to try this one the other day and boy, was it delicious. The vanilla, chocolate, and cinnamon characteristics made it taste like a liquified s’more. No joke. Commercial description: Imperial stout brewed with pumpkins Warlock is brewed to enchant your palate on its own and also to counterpoint our Imperial Ale, Pumking. Make your own black magic by carefully pouring this Imperial Stout into a goblet. Dark and mysterious, the Blackwater Series is serious about high gravity. Reanimate your senses with Warlock’s huge roasted malt character, moderate carbonation and spicy pumpkin pie aroma. Food pairings: Particularly tasty with spicy BBQ, smoked or roasted foods. Try it as a float with a scoop of organic vanilla ice cream, or paired with a slice of carrot cake. Pumking - Southern Tier Brewing Co. I couldn’t mention Warlock without giving a nod to its flavorful cousin, Pumking! Another must-have fall ale if you can’t get enough pumpkin flavor. This beer contains a whopping portion of pumpkin puree and according to the brewery, is “bewitched and brewed with pagan spirit”. Commercial description: All Hallows Eve is a time of the year when spirits can make contact with the physical world, and when magic is most potent. It is thought that we harness this magic to brew our powerful pumpkin ale. Not so, but it is with great respect to the magic of their trade that our brewers produce this fine beer. Take a whiff of this complex ale and your journey has just begun. At first sip, a magical spell will bewitch your taste buds, yet another victim enraptured by the Pumking. I’ll go ahead and apologize to all of you reading this in a state other than North Carolina. The Duck-Rabbit is an awesome brewery located in tiny Farmville, NC, about an hour and a half east of Raleigh, so their scale doesn’t allow them to distribute nationwide. If you ever make it to NC during the Fall, be sure to pick one of these gems up. It’s a wonderfully balanced marzen, which is the traditional style of beer that is served at most German beer gardens during Oktoberfest. Dark brown, full-bodied, and bitter, marzen is often kept in the cellar until late in the summer. There’s no corporate description for this beer yet but it’s dark amber in color, smells of caramel and fruit, has a slightly sweet and bitter taste. Wunderbar! Food pairings: Fried chicken with white gravy, roast leg of lamb, roast pork, chicken cordon bleu, sausage, and pretzels. This easy-drinking ale is more accessible to the general populace, and that’s great because it’s very tasty! I actually had it on the 1st of October when Jessica and I went to our favorite Raleigh restaurant, Poole’s Diner, for our 2nd anniversary! Most beer connoisseurs would consider this to be more of a “harvest” beer instead of a pumpkin because it isn’t very heavy on the pumpkin flavor. You will get a lot of spice aromas and a really nice sweet aftertaste that lingers pleasantly. Nicely balanced overall. Commercial description: A full-bodied brown ale with smooth hints of pumpkin and brown sugar. We brew our Punkin Ale with pumpkin meat, organic brown sugar and spices. As the season cools, this is the perfect beer to warm up with. Food pairings: Turkey, roasted duck, lamb, stuffing, dessert dumplings, sharp cheddar. Smashed Pumpkin - Shipyard Brewing Co. In case you couldn’t tell already, I’m a huge fan of pumpkin. If you share my sentiments, then this beer will not let you down. This ale is considered by most beer knurds to be in the top 10 of pumpkin beers because of it’s intense pumpkin flavor and brown sugar sweetness. That sweetness combines with the exceptional malt giving it a buttery pie crust flavor. Now who wouldn’t like that? 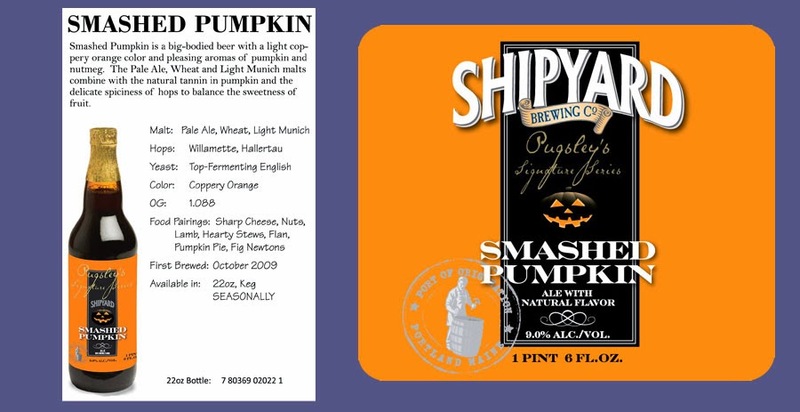 Commercial description: Smashed Pumpkin is a big-bodied beer with a light coppery orange color and pleasing aromas of pumpkin and nutmeg. The Pale Ale, Wheat and Light Munich malts combine with the natural tannin in pumpkin and the delicate spiciness of hops to balance the sweetness of fruit. Food pairings: roasted turkey, garlic mashed potatoes, roasted root vegetables, brown sugar squash pie. Be sure to keep your eye out for these beers in your local grocers or craft beer shops as some (especially Warlock & Pumking) are in very high demand and therefore sell out quickly. The word “seasonal” infers you won’t be able to have the opportunity to try them again until next Fall! Don’t fret though, there’s always a new season right around the bend. WINTER BEERS ARE COMING! I hope you all have enjoyed reading about the 5 spectacular beers. 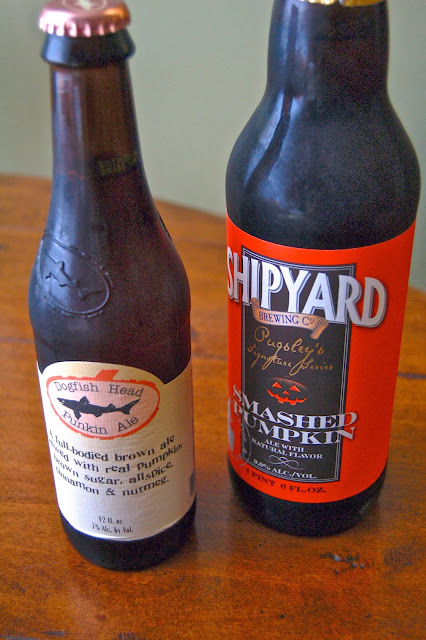 Do you have any Fall seasonal beers that I didn’t mention? I want to hear about them, so leave a comment below! Cheers!